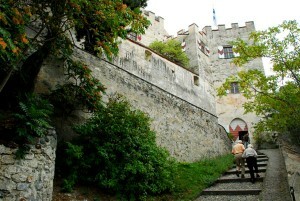 Our guests Art and Carol climb the steep stairs to the Churburg. We spent three memorable days and nights in the beautiful valley around Prato allo Stelvio, in Sud Tyrol, technically in Italy but the locals all believe they are Tyroleans first, Italians a distant second. We were told by the mayor of the town, perhaps a distant relative of our guest, to go and visit the Churburg fortress on the other side of the valley. Naturally we took him up on his suggestion and spent a very pleasant hour or so there wandering around while on one of the excellent guided tours. Our guest Art had been told previously that there was a painting inside the castle showing a relative of his, Josef Pingera, about to climb the Oertler, a huge mountain which hovers over the valley. 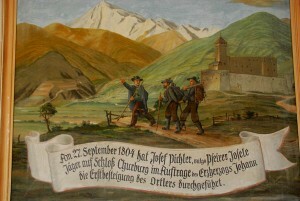 It was in September, 1804 that Pichler and a companion first climbed the Oertler. Not only is there a painting at the castle, where Pichler was the huntsman, but there is a monument on the road which winds its way up to the Stilfersjoch Pass. Both sights were worth the climb. Memorial to Josef Pichler who climbed the Oertler Mountain in September, 1804. Posted in Europe Tours, Family History Tours and tagged 1804, ancestral, ancestry, climb, climber, europe, mountain, oetler, pichler, private, tours, travel.